Last month the family and I had a chance to spend the day Portland, Maine. We walked around the town and hit up several spots that will certainly appeal to foodies looking for something unique to experience or purchase to take home. Arriving at bit after lunch time, I wanted to avoid the usual fried seafood joints off Portland’s main drag, and headed over to Duck Fat. I’d read about Duck Fat online and liked their angle. 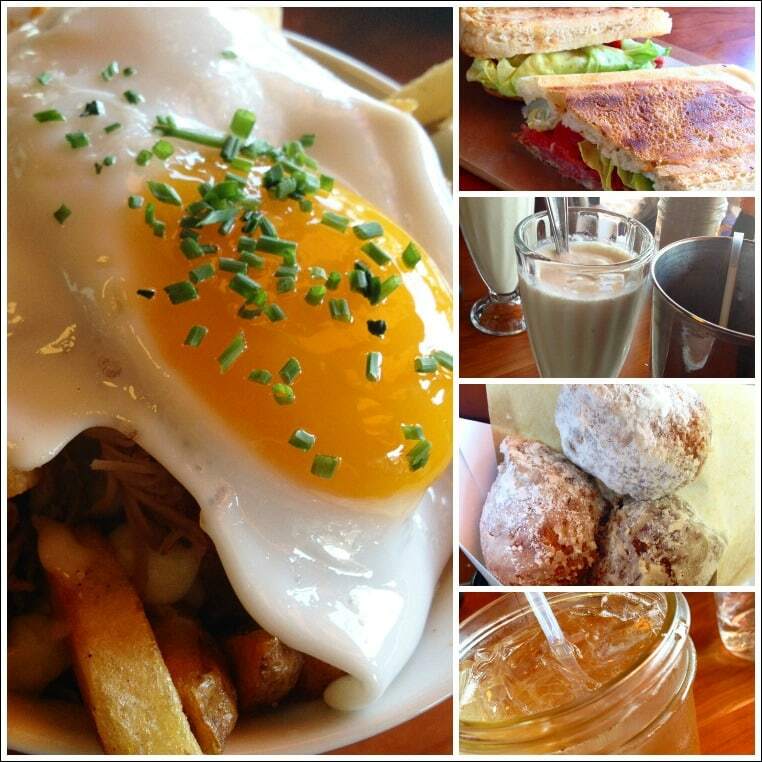 They use clarified duck fat in many of their amazing dishes from milkshakes to duck fat fried French fries. While I was a little worried about the “Ewww, gross Mom!” factor, I figured panini sandwiches, the fries, and milk shakes would certainly please the kids. Nathan had a Panini Meatloaf Sandwich and Lucie went for the Duck Fat Fries along with some truffle ketchup. I went for the Poutine, which is a mess of duck fat fried potatoes covered with cheese curds with a little duck meat thrown in (you have to ask for the duck meat if your server doesn’t suggest it). It’s topped with an egg and gravy if you wish. (I asked for my gravy on the side. The runny egg was plenty and the gravy, while lovely, would have been over the top.) The Poutine comes in an individual (small) portion or a large one that can be shared among several people. I tried one of their craft sodas, an All Maine Tonic made with apple cider vinegar, which helped cut the heaviness of lunch. It was perfect because the kids and I ended the meal with an order of duck fat fried donut holes sprinkled in powdered sugar. We dipped ours into a duck fat chocolate and caramel syrup, but agreed the chocolate was best. While we thought our lunch at Duck Fat was delicious, it certainly was heavy. So plan to do a bit of walking to burn it off after lunch. Also, when we showed up at 1 pm, we had a half hour wait. By the time we were seated (we had to share a table with another family as the restaurant is small and seating is limited) the wait was 90 minutes. The reason? Duck Fat was recently written up in Food & Wine magazine by Andrew Zimmerman of Travel Channel’s Bizarre Foods. He loved it as much as we did! If you love looking at wonderful cookware, glassware, table linens, cookbooks and more, you could spend hours just poking around LeRoux Kitchen. It’s located right on the waterfront in the heart of the Old Port, so it’s easy to stop by on your way to seeing anything in Portland. Unfortunately, the kids were not as enchanted as I was, so I could only spend a few minutes looking around before I got the, “Oh Mom, I’m bored.” look. Next time, I’ll send them off somewhere on their own so I can browse! Bam Bam Bakery is a coffee house and bakery and their selection of gluten free goodies is impressive: cakes, pastries, breaks, cookies, cinnamon rolls, pies, quiche and more. You can also get breakfast and lunch there, too. I ordered a huge slice of scone to go that lasted me for two breakfasts. It was not only delicious but moist. I wish I lived closer. Than again, maybe my waistline does not! The Salt Cellar sells flavored finishing salts, Himalayan salt tiles, bath salts, and salt lamps. The store in Portland is also home to he largest Himalayan salt lamp in North America weighing in at nearly 500 pounds! The kids and I had a fun time trying out all the finishing salts. I ended up buying several types including merlot, sriracha and an applewood smoked salt. What really intrigued me was the Himalayan salt blocks for salt block cooking. While I didn’t buy a slab (I really thought it would be a nightmare to take home), I did buy Himalayan Shot Glasses for tequila and Salty Swizzler Sticks for Bloody Marys. You can buy the salts and salt block cooking accessories through the Salt Cellar’s online store. You may only know Stonewall Kitchen from their catalogs, but they have stores, too. There’s one in Portland where they offer demonstration cooking classes in the evenings. You can also go in and sample their jams and dips, pick up a few free recipe cards, get a free SWK “No toast should go naked” bumper sticker, and buy the cutest Maine dishtowels sold in Portland. My kids have been bugging me to get them jerky for ages, so when I saw the North Conway House of Jerky I thought we’d stop by and get some snacks for the plane ride home. I wasn’t disappointed as they had a variety to fit everyone’s tastes. They even have vegan and gluten free products! We visited their store in Portland, but their main store’s in North Conway, New Hampshire. Both children kept their jerky for the trip home and while Lucie wasn’t happy with her flavor choice, Nathan thought both were fantastic. I had samples of each and unlike the jerky you get at the store, it wasn’t too dried out and chewy. Good stuff for the price! To find out more about what to do in the Old Port section of Portland, check out Portland’s Downtown District and the Public Market House. 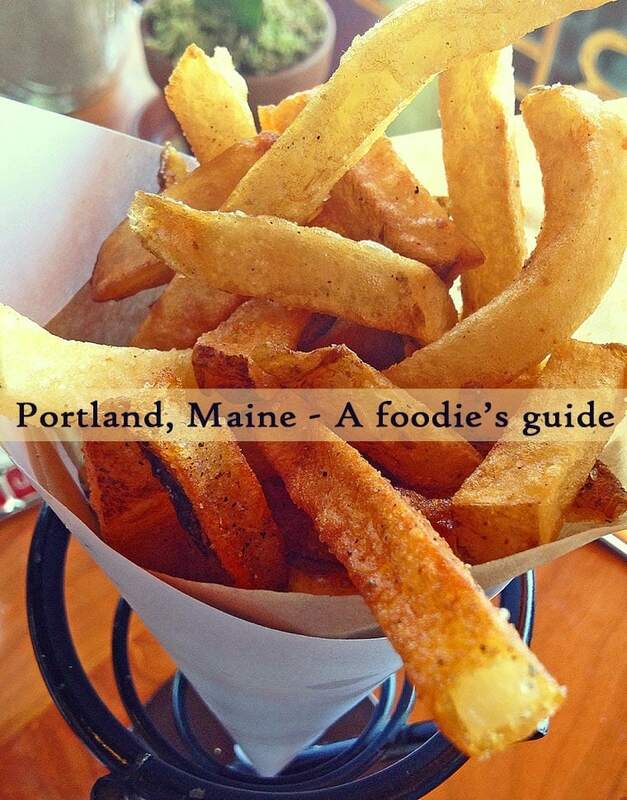 Posted in Restaurant Reviews, Travel and tagged Maine on August 25, 2014 by Anne-Marie Nichols.